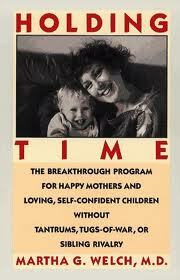 Holding time is a breakthrough parenting strategy - a revolutionary approach to mother-child bonding that can make all children happier, more cooperative and more self-confident. This simple, scientific program is based on the nurturing bond that forms when you hold your child. With regular holding time sessions, you'll see your children become more loving and less demanding as your own self-esteem grows. Dr. Welch has already enjoyed remarkable success in solving everything from bed-wetting and hyperactivity to sibling rivalry in patients ranging from infancy to their preteen years.